Update Feb 7 2011: The official review talk, its accompanying notes and related material is now available to download [here]. 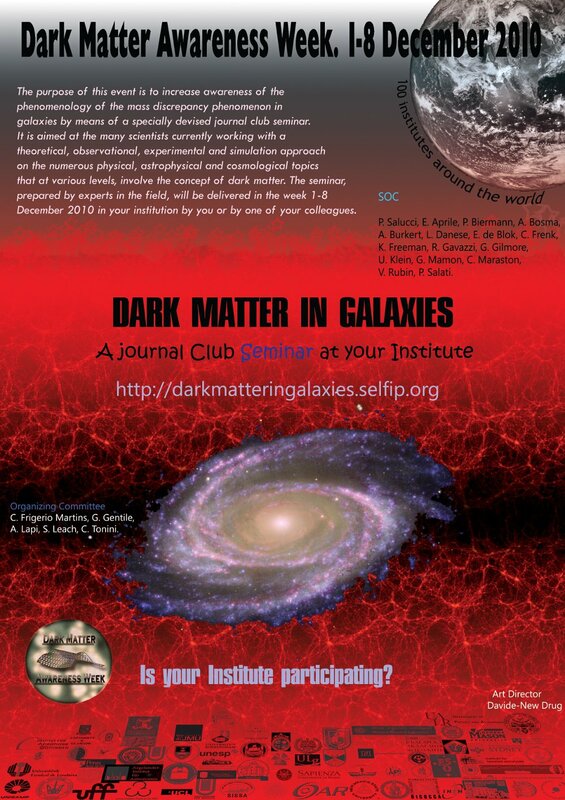 The Official DMAW review presentation, Dark Matter in Galaxies, and explanatory notes will be published from this website and on the arxiv on 28 January 2011. This review will be the outcome of the DMAW initiative. It will be an evolution of the present reference material improved upon by the SOC and based on suggestions we receive, and completed with a content taken from individual presentations of the DMAW 2011 speakers. Poster: Small [360KB], Medium [1.8MB]. Departmental poster for journal club: Send a request with your full postal address to salucci@sissa.it. We discuss the details of the mass discrepancy phenomenon in galaxies usually accounted by postulating the presence of a non luminous component. In the theoretical framework of Newtonian gravity and Dark matter halos we start by recalling the properties of the latter as emerging from the state-of-the-art of numerical simulations performed in the current LCDM scenario of cosmological structure formation. We then report the complex and much-telling phenomenology of the distribution of dark matter in spirals, ellipticals, and dwarf spheroidals. Care will be given to show that such a coherent observational framework is obtained from different and large samples of galaxies and by means of very different methods of investigation and by exploiting different tracers of the gravitational field. These include rotation curve and dispersion velocities mass fitting, X-ray gas property analysis, weak and strong lens signal mass decomposition, analysis of halo and baryonic mass functions. We will then highlight the impressive evidence that the distribution of dark and luminous matter are closely correlated. Hints on how the empirical scenario of the mass distribution in galaxies, including the Milky Way and the nearby ones affects the cosmological investigations are given throughout the talk. Among them, the theoretical constraints on the elusive nature of the dark matter particles and its direct and indirect searches. Finally, it is suggested that at least part of this phenomenology should enter in the standard knowledge background of cosmologists.